Uncial has a formal, serene appearance enlivened by the rhythmic alternation of narrow and rounded letters and the ripple of the short ascenders and descenders. Your pen angle should be 0-15 degrees (ie pointing straight up the page). Rotate the page anticlockwise before writing, so your wrist is not cocked too steeply for comfort, or use a specially-designed nib. If you're using a quill, it helps to cut it so the left corner forms an acute angle. Uncial letterforms are around 4 nib-widths high with another nib-width above and below for short ascenders and descenders. Allow a good half-line at least of space between lines of script. Uncial is characterised by its strongly rounded, graceful and powerful aspect. It does not slant. Letters should be carefully spaced. Serifs are straight-topped and their underside curls smoothly into the letter. Some twisting and lifting of the nib is useful to form parts of 'A' and 'N' and the thin diagonal strokes of 'V', 'W', 'X' and 'Y'. A nib-twist can also be used to create 'drooping' serifs on the branches of 'C', 'E', 'F', 'G' and 'S'. 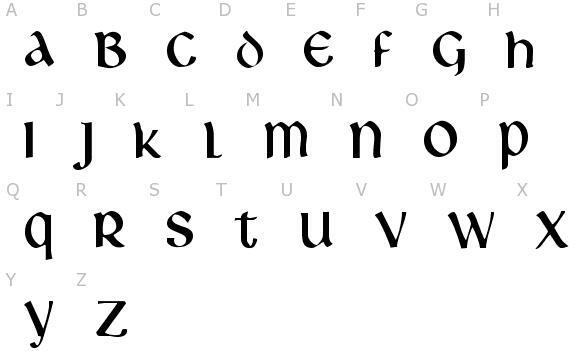 Often, minuscule forms are mixed into uncial from 'half-uncial', which is historically a different script of similar appearance which has strong Celtic associations. The variant letters are generally 'a', 'b', 'd', 'g' and 't'.